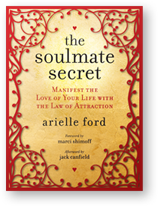 Arielle Ford, who is best known for her work with dozens of best-selling authors, including Deepak Chopra, Wayne Dyer, Marianne Williamson, Neale Donald Walsch, Jack Canfield and Mark Victor Hansen, knows how daunting it can be to find “the One,” especially if you’re over 35. She also knows that finding your soulmate is possible – regardless of your age, your body type, your financial situation or your personal history – if you’re willing to ready yourself on all levels to become a magnet for love. The Soulmate Secret: Manifest the Love of Your Life with the Law of Attraction will teach you powerful manifestation techniques, prayers and rituals you can do right now to magnetize BIG LOVE into your life.